Students and officials from EC and Kendai High School with President Marie-Louise Coleirto Preca (front row, centre) at San Anton Palace. To celebrate the 15th anniversary of the educational partnership between EC and Kindai High School, a group of students from the Japanese school who were recently in Malta attending an English language course at EC and cultural integration classes at St Martin’s College, visited Presi­dent Marie-Louise Coleiro Preca at San Anton Palace, Attard. During the visit, EC CEO Michael Xuereb presented the President with a cheque for €1,500 for The President’s Trust, and the students were given a tour of the palace’s State rooms. Previously, the students visited an afforestation project in Qrendi where over the past few years, students from Kindai and others from EC have planted over 200 indigenous and endemic Maltese trees and shrubs as part of the 34U initiative and EC’s Giving Back programme. Environment Minister José Herrera and Qrendi mayor David Schembri met the students and took part in a tree-planting ceremony. 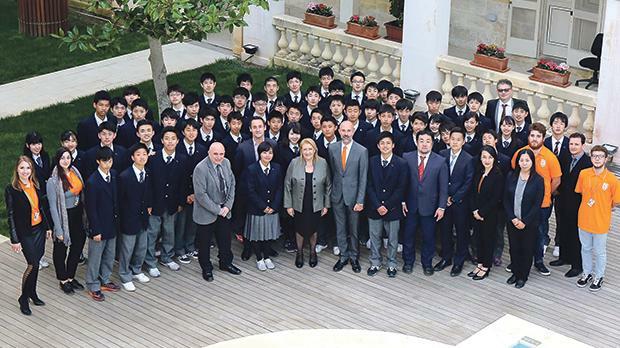 A Japan-Malta cultural exchange experience was also held at St Martin’s College which was attended by Malta’s ambassador to Japan André Spiteri.